S&F dosing systems are used for the controlled feeding of a screening machine or as a storage container with buffer function for downstream systems. They ensure a constant feed of different kinds of piece goods and bulk materials. Dosing systems from S&F enable the dosing of piece goods and bulk materials which is gentle on the product. 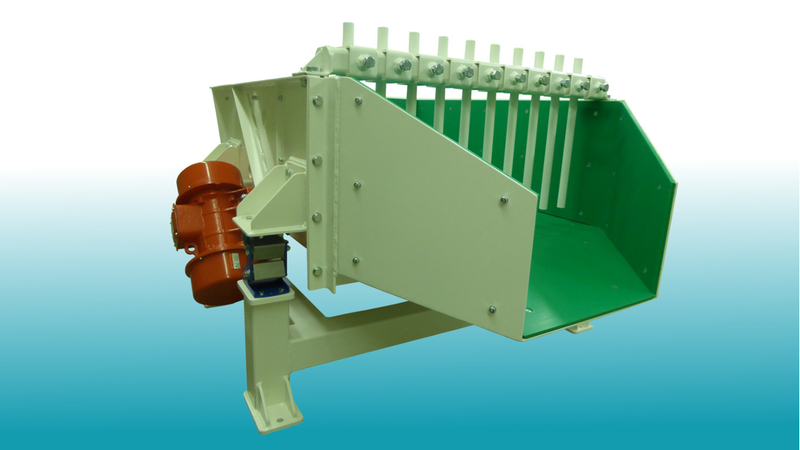 Our AVB series of vibrating hoppers with imbalance motors - which are operated synchronously in opposing directions - are used for the dosing of light materials, piece goods and bulk materials. They are used, for example, as storage containers at our screening machines. S&F vibrating tables and vibrating dosing systems with a robust drive based on a crankshaft are used, for example, as intermediate hoppers for the dosing and feeding of piece goods and bulk materials. Vibrating tables of the AVT series are primarily used for the large-scale feeding of piece goods, whereas the AVD-type vibrating dosing systems are designed with high side walls for large loads in the bulk material industry. Our ABB line of rubber belt box feeders based on a belt conveyor are used for holding and discharging large quantities of bulk material during operation. They enable the constant feeding of downstream systems. All dosing systems are robust, low-maintenance and convey the feed material gently and evenly.